Former Indiana First Lady Judy O’Bannon Willsey urged the 93 graduates at Butler University’s winter commencement ceremonies to embrace the opportunities ahead of them. O’Bannon, whose husband Frank was governor of Indiana from 1997-2003, said the challenges can seem daunting and the world bleak. But from the cavemen on, human beings have always been able to deal with whatever came along. 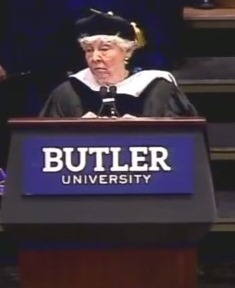 President James M. Danko presented O’Bannon with an honorary Doctor of Humane Letters—the same degree her husband received at Butler’s commencement in 1997. “Continue to serve your families, your friends and your communities as you have done here at Butler University,” he said.